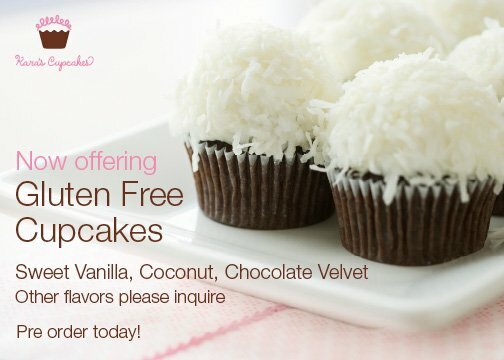 Kara's Cupcakes in San Francisco/Bay Area has introduced gluten-free cupcakes at their flagship Marina store in vanilla, coconut and chocolate velvet and, as per below (via their Facebook page), will be offering gluten-free cupcakes at their other locations starting Wednesday. See www.karascupcakes.com or @karascupcakes on Twitter for more information. If you're in the Boston area and looking for some great gluten free cupcakes, try Glutenus Minimus in Belmont. It's a dedicated gluten free bakery and they are always doing great new flavors!